Make your home sparkle inside and out when you hire our window washing services team in Des Moines and Ames, Iowa. At Day Star Window Cleaning Services LLC, we help you take pride in your home and business by offering unrivaled cleaning services at reasonable rates. As we treat our residential and commercial clients with a high standard of quality, we take the time to not only clean the glass of your windows, but the molding and frames as well. We also clean skylights, ceiling fans, light fixtures, chandeliers, as well as offer our services for families moving in and out of their homes. Unlike our deck services, we are happy to offer you a quote, as well as schedule services, over the phone. During our phone consultation, we simply ask you for the number and types of windows you have to create an estimate. Upon arriving at your location, we can make adjustments to the price after our walk around. For our full-service job, we give you an hour window for our technicians to arrive and we are prompt in notifying you of any schedule changes. Please note, payment should be received after the completion of our job. Our commercial clients rest easy when they know our team is on the job, as we use a five-step cleaning process every time. After wetting the window or place with a strip washer, we use a 6" stainless steel razor blade to remove any and all dirt and grime. We wet the glass again before using a squeegee to remove excess water and solution from the glass. Our final step entails careful detailing with microfiber or surgical towels for a spotless, long-lasting shine on the glass and molding. We also clean screens and vacuum window sills. At our service, we recommend letting our team stay on top of the regular maintenance of your windows. The inside and outside surfaces of your windows should be cleaning once or twice a year, while the exterior receives service once a quarter. While we do offer one-time services, we offer you the opportunity to take advantage of our weekly, quarterly, and regular maintenance plans. Through our regular plan, we clean your windows three times a year, with the exception of the winter quarter unless specifically requested. Day Star counts 1 Plate as 1 Piece of glass so you want to count each piece of glass. What is the process of cleaning the windows? 5. Detail - Micro fiber or surgical towels: detail molding and window. Do I need to move anything? If you could please move any pictures, figurines or breakables away from the windows and any furniture as well. Thank you! Do you offer glass maintenance for residential? Yes we do offer a regular glass maintenance cleaning for residential customers. Most residential customers who are having their windows cleaned on a regular basis find that having their windows cleaned on a quarterly basis on the exterior and are cleaned on the inside and out once or twice a year keeps their windows looking great! 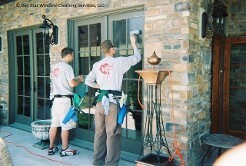 You may also have your windows cleaned more often such as monthly or bi-monthly on the exterior. Request an estimate to enjoy the look of a shining home with the help of our window cleaning services.